Wild Goose Island Overlook along the Going To The Sun Road in Glacier National Park. 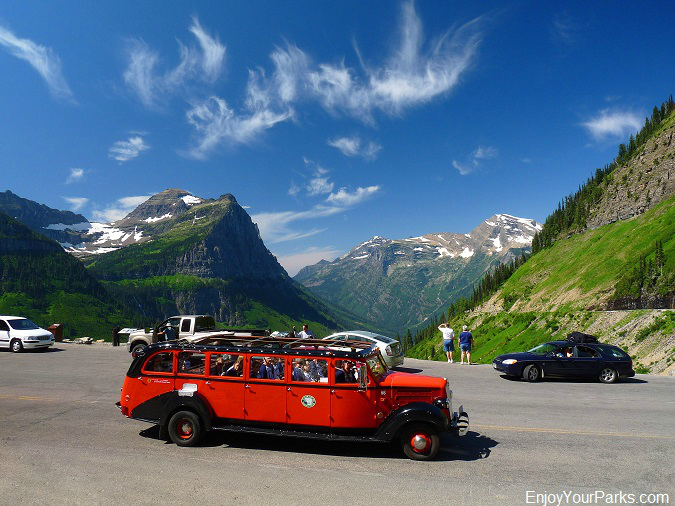 Going To The Sun Road, Glacier National Park. Apgar Village is basically the west entrance of the Going To The Sun Road in Glacier National Park, and is the hub of the west side of Glacier Park. It's definitely worth checking out... even if it's to simply enjoy one of the most classic views of Lake McDonald. 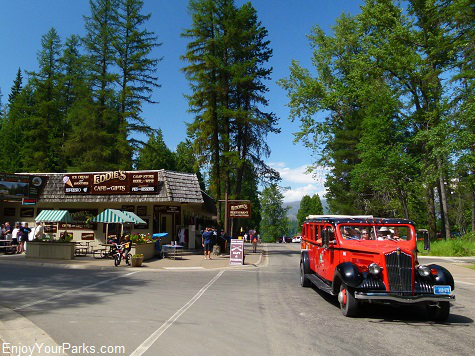 Apgar Village in Glacier National Park has restaurants, motels, cabins, hotels, gift shops, general stores, visitor center, campground and backcountry ranger station. Apgar Village is also where there is a fantastic beach along Lake McDonald, which is an extremely popular place to enjoy the water and the iconic view. Lake McDonald as viewed from Apgar Village in Glacier National Park. Along the Going To The Sun Road heading east from Apgar Village, the Sun Road follows the south shore of Lake McDonald as it works its way eastward. 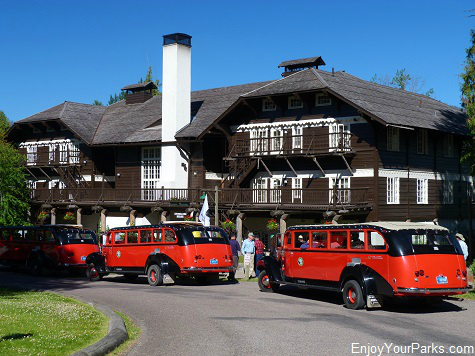 At about the 10 mile mark along the Going To The Sun Road, you will encounter the historic Lake McDonald Lodge. This charming lodge is a National Historic Landmark and very much worth some time to explore. Lake McDonald Lodge is also a great place to stop and enjoy the lake, as there is a great beach right next to the lodge. Lake McDonald Lodge is one of the most popular destinations for Glacier Park visitors who are spending time on the west side of Glacier Park. McDonald Falls is located along the Going To The Sun Road less than two miles west of Lake McDonald Lodge. The pullout is not marked, but there is a fairly large area to park. The falls are more like cascades rather than a straight up and down waterfall, but none-the-less is quite impressive, especially during the early summer when McDonald Creek is really roaring! This is a view of McDonald Falls from the other side of McDonald Creek. The Going To The Sun Road is directly on the opposite side of these falls. 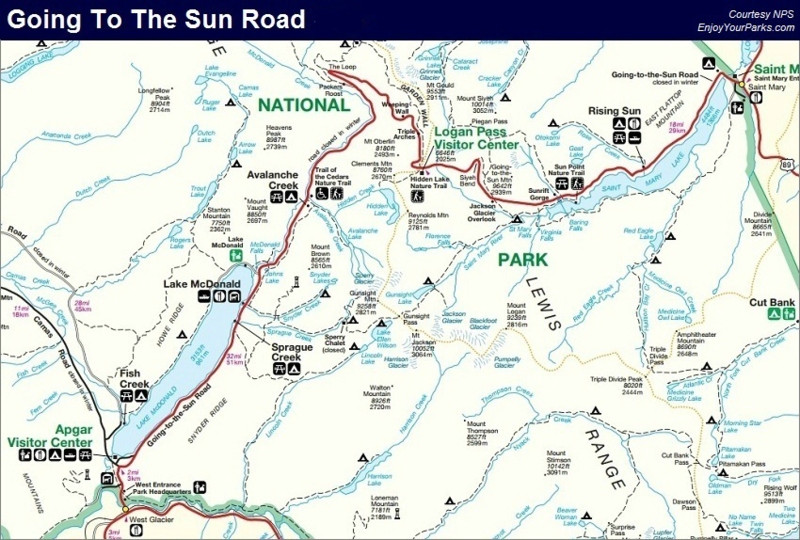 This pullout is located about 2.5 miles northeast of Lake McDonald Lodge. Sacred Dancing Cascades along the Going To The Sun Road. Sacred Dancing Cascades is a series of waterfalls and rapids along McDonald Creek, and are quite beautiful. This is a roadside cascade that only requires a short two minute walk to get from the large pullout to the footbridge. The Sacred Dancing Cascades in Glacier National Park are very scenic as you watch the turquoise-colored water cascading down the water-carved rocks. During the time of the highest run-off from snow melt each year, these cascades are really roaring. 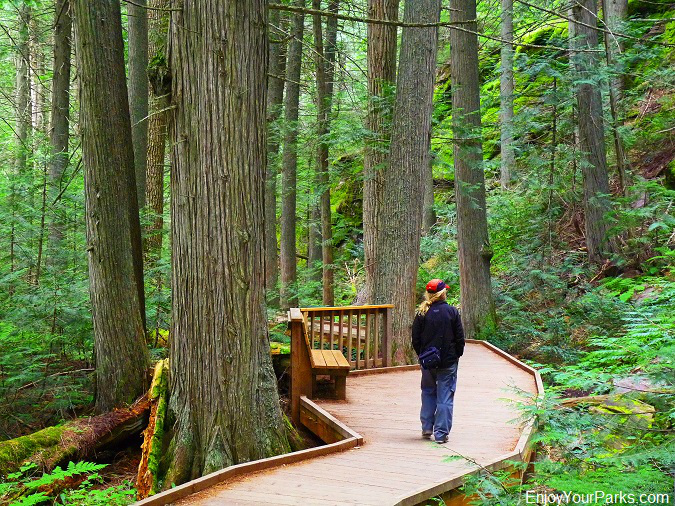 The Trail of the Cedars is a "must see" while visiting Glacier National Park. The Trail of the Cedars is located about 6 miles east of Lake McDonald Lodge along the Going To The Sun Road. This gorgeous walk is less than a mile long, but absolutely worth the time to walk it. 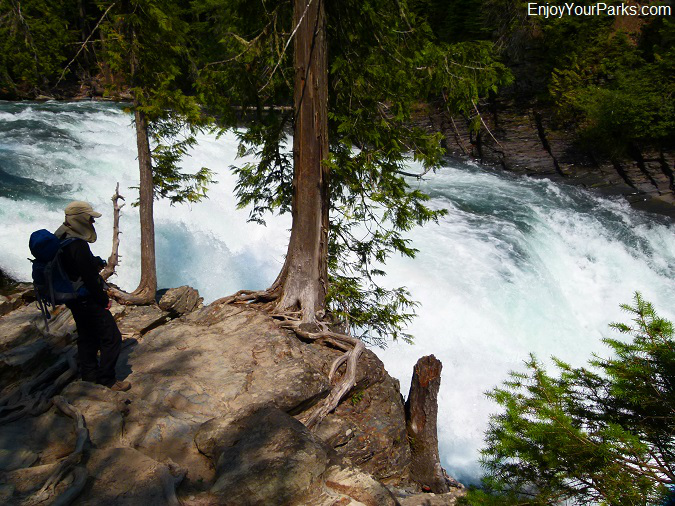 You will be surrounded by huge old growth trees and you will also get to enjoy the famous Avalanche Gorge. 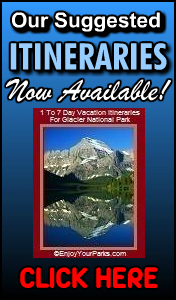 This is a "Must See" while visiting Glacier Park. For detailed information on the Trail of the Cedars click here. 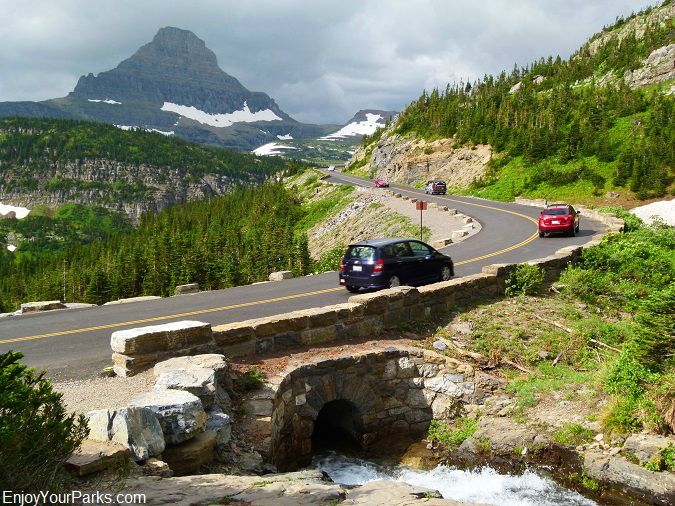 The Loop is located about 6.3 miles west of Trail of the Cedars as you are heading up the west side of the Continental Divide toward Logan Pass along the Going To The Sun Road. This is the only switchback on the entireGoing To The Sun Road, which really makes you understand why this magnificent road is such an engineering marvel. There are restrooms available as well as parking and a shuttle stop. This is where the popular "The Loop" Trailhead is located. This trail connects up with the Highline Trail at the Granite Park Chalet, and is a popular trail for hikers to take down off the Highline Trail to get back to the Going To The Sun Road. The Highline Trail is one of the most popular Glacier Park hikes, and is one of the Top Ten Things To Do in Glacier National Park. For more info on "The Loop" Trail and the Highline Trail, click here. There are several smaller west side pullouts as the Going To The Sun Road works its way toward Logan Pass. The views from these pullouts are spectacular, and if they are not taken by another vehicle, make sure to stop and enjoy the views! 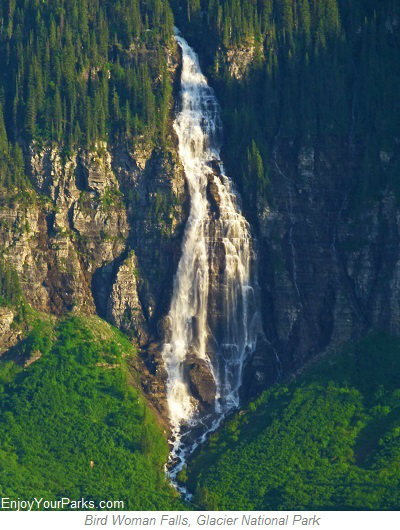 The impressive Bird Woman Falls is located below Mount Oberlin, and is easily viewed from the west side of the Going To The Sun Road (See Photo Right). 560 feet in height, Bird Woman Falls is not the tallest falls in Glacier National Park, but is one of the most popular due to its location. These famous falls are fed by a retired glacier which is now a permanent snow field located on the north face of Clements Mountain. Directly below this permanent snow field is a classic example of a "hanging canyon" that was carved out by glaciation that occurred about 10,000 years ago, and was cut off" by another glacier during the same ice age, and is where Bird Woman Falls is now located. These falls are especially dramatic in early summer during the maximum snow melt-off. There are several smaller turnouts that will allow you to view this impressive falls. As you view the Bird Woman Falls, you can't help but notice the famous triad of Mount Oberlin, Clements Mountain and Cannon Mountain. These mountains dominate the dramatic view to the southwest as your vehicle works it's way up the west side of the continental divide and eventually reaches Logan Pass at the top of the divide. Haystack Falls is another popular water fall along the Going To The Sun Road. These falls are measured to be about 490+ feet in height, but is actually much taller when you consider the seemingly infinite cascades as the water descends down the west slope of the Garden Wall at Haystack Butte down to McDonald Creek thousands of feet below. 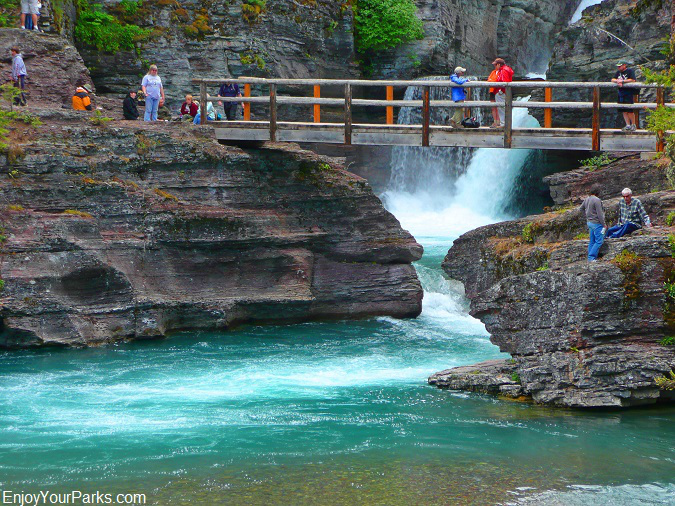 There is a bridge along Going To The Sun Road that takes you over these incredible falls, and there is a small turnout where you can get a photo of your family and the falls towering over them. Haystack Falls along the Going To The Sun Road in Glacier National Park. 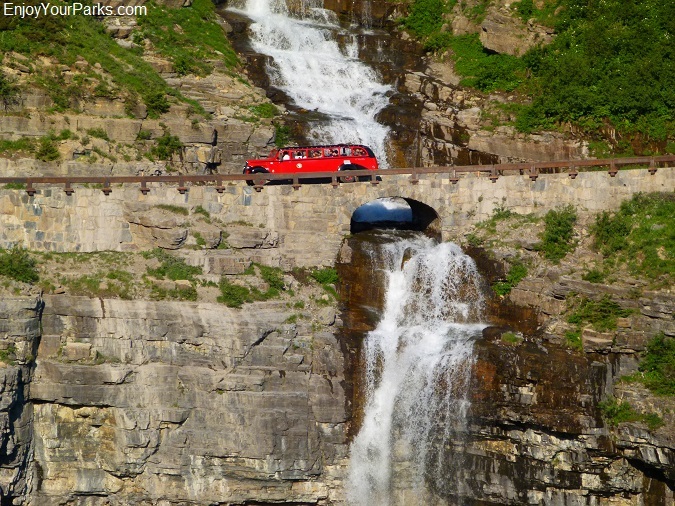 The Weeping Wall is a geological formation found along the Going To The Sun Road's west side. It's located about 3 miles west of Logan Pass, and you can't miss it because you're going to drive right through it's waterfall! The water seeps out from the side of the Garden Wall, which is fed by seasonal runoff from the melting snow and ice, and well as being helped by spring fed waterveins that were exposed during the construction of the road. 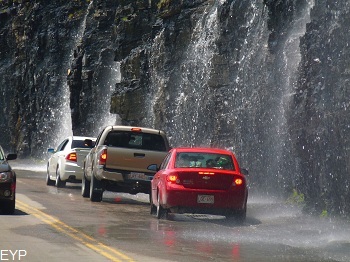 During the spring it is an awesome spectacle watching the water gush off this famous wall onto the road. This makes for a great car wash while enjoying your drive! Now of course later in the summer the amount of water lessens, but it's still equally as beautiful and fun to drive along! 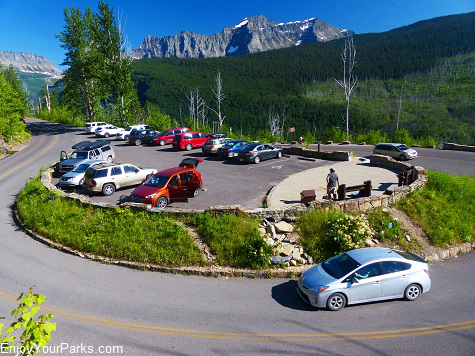 Big Bend is a great place to get out of your vehicle along the Going To The Sun Road in Glacier National Park and enjoy a world class view! Just beyond the "Weeping Wall" as you're heading toward Logan Pass, there is a large turnout known as the "Big Bend". The view from this turnout is nothing less than magnificent, and it's definitely worth stopping at for awhile. Mount Oberlin, Cannon Mountain, Clements Mountain and Heavens Peak reach for the sky right in front of you, and you can look down a deep valley where your journey up the west side began. In mid July one can see quite a nice display of bear grass blooming here, and later in the season fireweed also makes quite an appearance. Big Bend offers one of the road's most spectacular vistas with plenty of parking space. The Big Bend is an extremely scenic pullout along the Going To The Sun Road in Glacier National Park. The Going To The Sun Road is a civil engineering marvel, and the Triple Arches is one of the iconic structures along the Going To The Sun Road built (completed in 1932) to "hold up" this world famous scenic roadway as it works it's way to the top of the Continental Divide at Logan Pass. There is not a very large turnout to stop and view this famous structure, but you can see it as you slowly wind up the cliffs of the west side of the Sun Road. 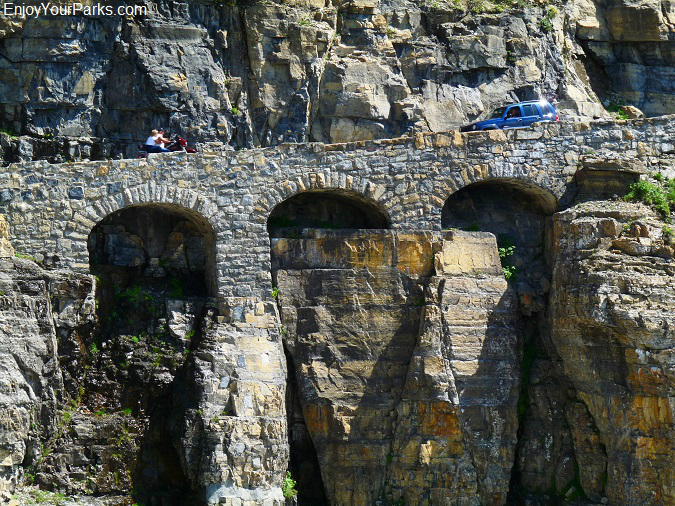 Triple Arches is but one of the many civil engineering marvels found along the Going To The Sun Road. The Oberlin Bend in Glacier National Park provides a spectacular view of the west side of the Going To The Sun Road and the surrounding mountains. Immediately west of Logan Pass below the cascading waterfalls of Mount Oberlin, is the ever popular Oberlin Bend. 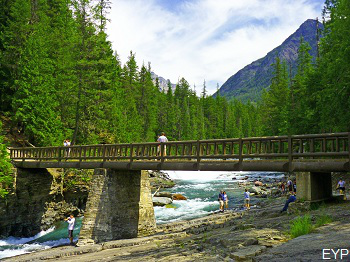 A short, easy and accessible boardwalk offers breathtaking views of hanging valleys and the Going-to-the-Sun Road as it winds up the side of the west side of the Continental Divide, and across the landscape below the monstrous Garden Wall. 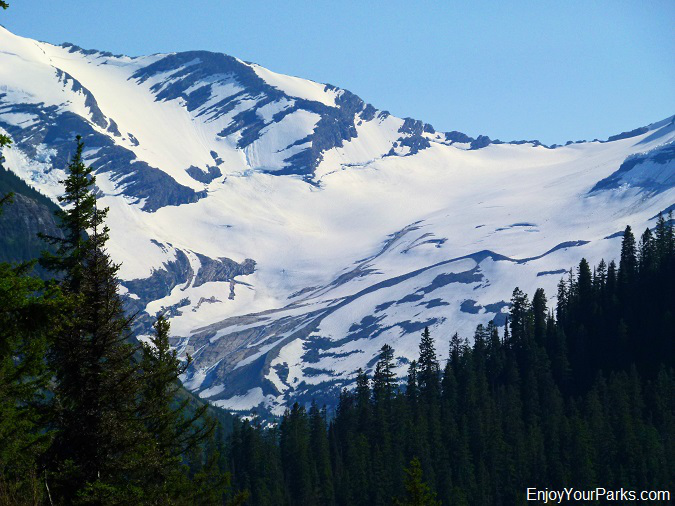 This is an ideal place to see mountain goats in all of their glory! 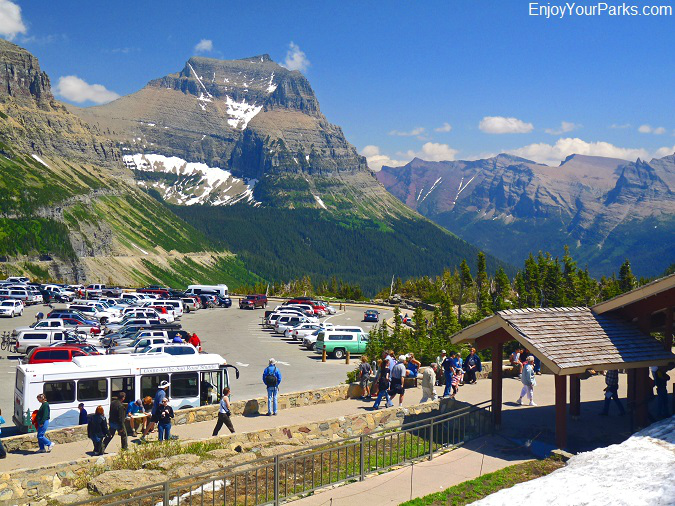 Watching them effortlessly climb their way up and down the side of Mount Oberlin is in itselfworth the stop along this popular Going To The Sun Road pullout in Glacier National Park. Logan Pass Visitor Center on the Going To The Sun Road on opening day, July 13, 2011. Logan Pass is the highest point along the Going To The Sun Road, and is one of the most popular spots in Glacier National Park. 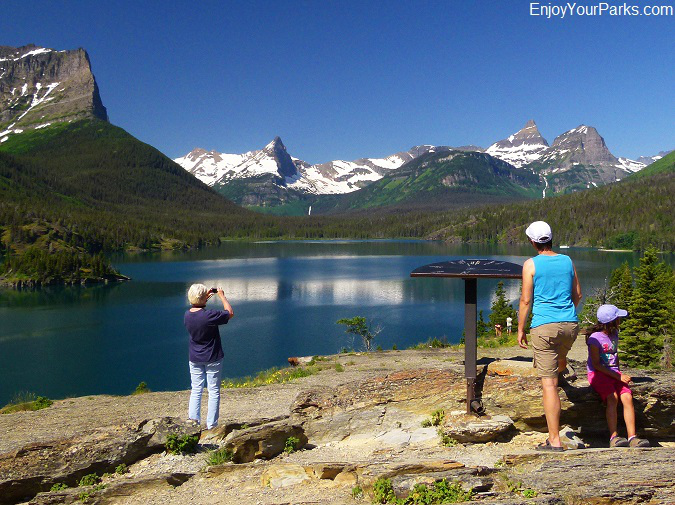 Not only are the views breathtaking here, but there is also the Logan Pass Visitor Center, as well as trailheads to two incredibly famous and popular Glacier Park hikes: The Hidden Lake Overlook and the Highline Trail. 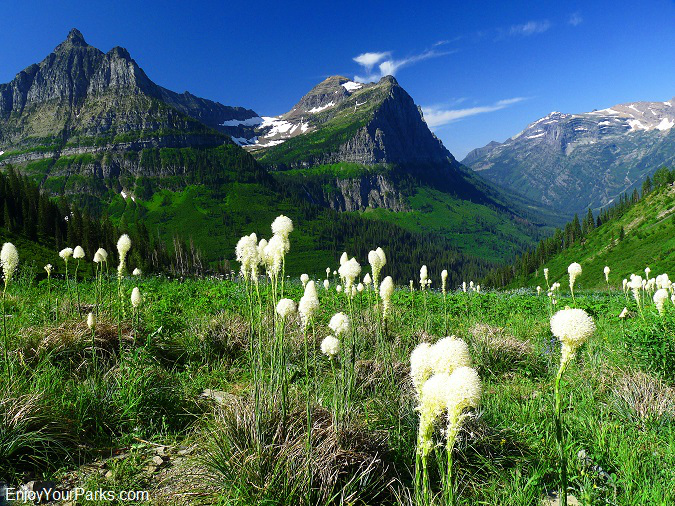 These two hikes are among the "Top Ten Things To Do In Glacier National Park". For more information on Logan Pass, click here. The views from the Logan Pass along the Going To The Sun Road in Glacier National Park are absolutely breathtaking! Lunch Creek is located about one mile east of Logan Pass along the Going To The Sun Road. It's the first creek the road crosses when heading east from Logan, and it’s name says it all...This a great place to stop and have lunch (or a quick snack)! Lunch Creek flows down a natural rock staircase from the towering backdrop of Pollock Mountain to the north. The natural staircase that was formed by Lunch Creek is a gorgeous sight indeed. In the summer Lunch Creek is blanketed with thousands of wildflowers in every color imaginable, and is also a popular hang out for big horn sheep rams! Lunch creek is less than a mile to the east of Logan Pass along the Going To The Sun Road, and is a popular place for Glacier National Park visitors to stop and enjoy the creek and the beautiful scenery. There is a fairly large parking area which makes this stop very convenient. 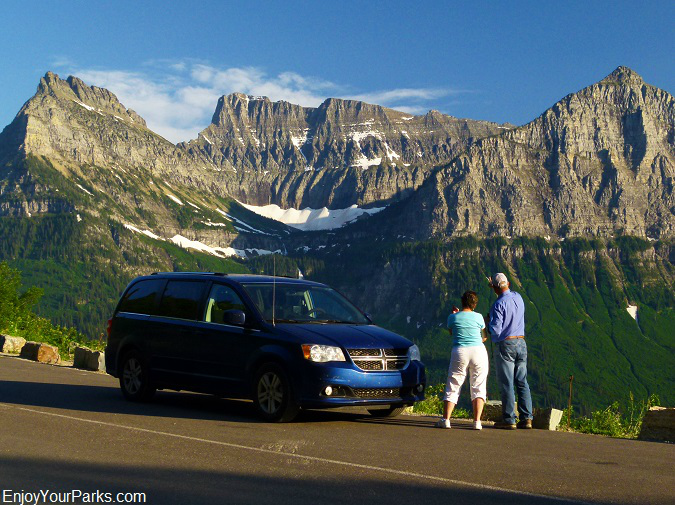 There are several smaller pullouts along the east side of the Going To The Sun Road that provide exceptional views. These pullouts are very much worth taking if they are available. 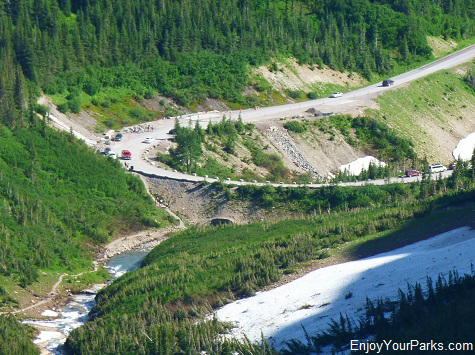 The Siyeh Bend is a very sharp curve and is located on the Going To The Sun Road about 3 miles east of Logan Pass. 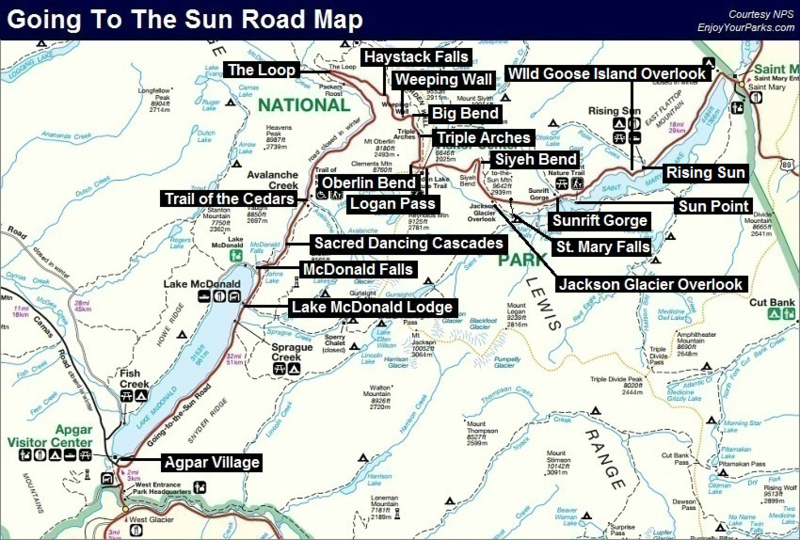 Siyeh Bend is where the trailhead is located for the Glacier Park hikes to Siyeh Pass and Piegan Pass. 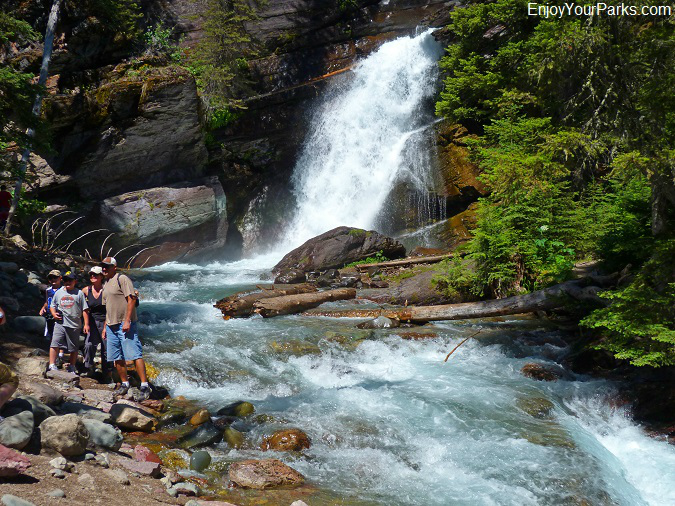 These amazing hikes originating at Siyeh Bend are among the most popular hikes in Glacier Park. If you like gorgeous hikes in the middle of paradise, you really need to check out these world class hikes. There is also a shuttle stop located at Siyeh Bend. Siyeh Creek runs underneath the Going To The Sun Road here, and the view is remarkable. This is the classic view of Jackson Glacier from the Jackson Glacier Overlook along the Going To The Sun Road in Glacier National Park. 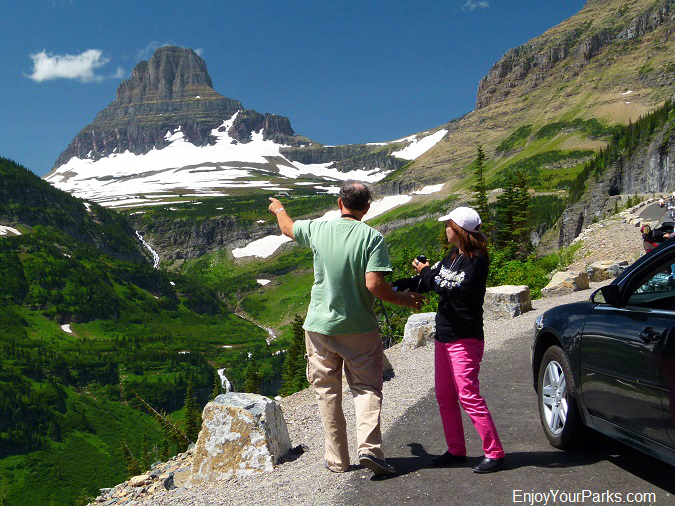 This pullout gives you the best view of the world famous Jackson Glacier anywhere on the Going To The Sun Road. Jackson Glacier is approximately the seventh largest of the glaciers in Glacier National Park, and is a part of the largest grouping of glaciers in the park known as the Blackfoot-Jackson Glacial Complex. Jackson Glacier rests on the northeast side of the majestic Mount Jackson, which is one of the six peaks over 10,000 feet in Glacier Park. 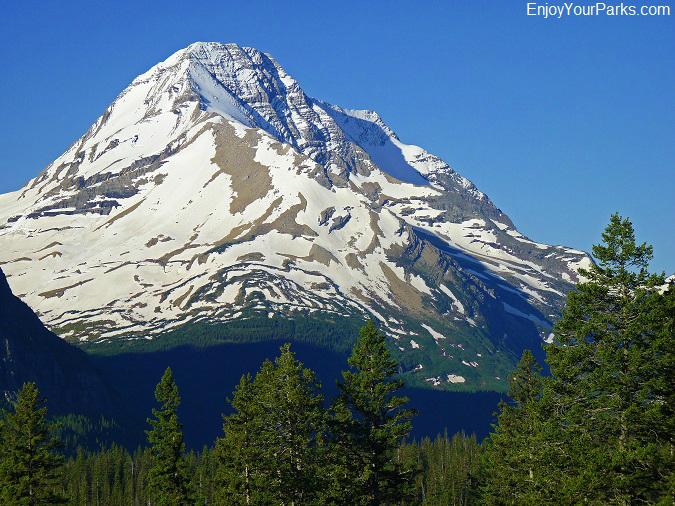 You can get some good photos of Jackson Glacier here, and here's a quick tip: there is another pullout with restrooms just east of the Jackson Glacier Overlook which also provides a view of the glacier and the mighty Mount Jackson. 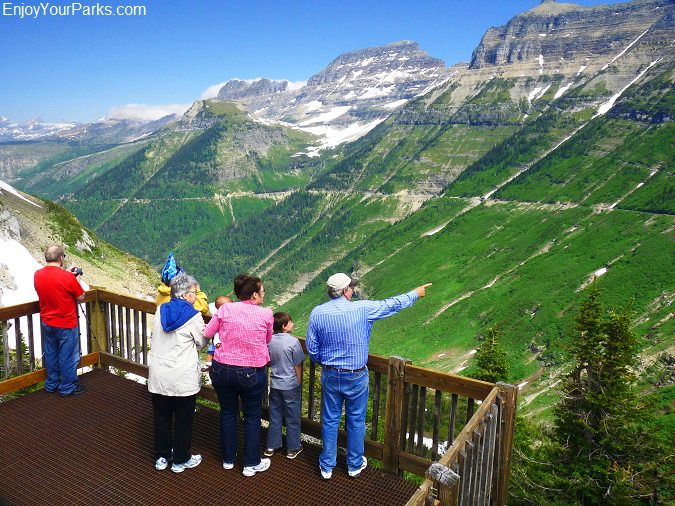 The Jackson Glacier Overlook along the Going To The Sun Road is also the trailhead for those Glacier Park hikers who are hiking to Gunsight Pass and beyond. 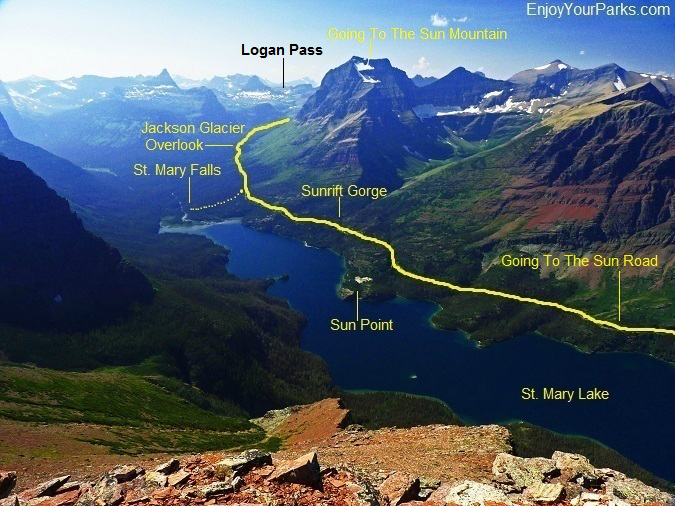 The hike to Gunsight Pass is a very popular day hike and overnight backpacking hike in Glacier Park, and is one of our favorite Glacier Park hikes. For detailed information on this hike, click here. This is the view of Mount Jackson from the Jackson Glacier Overlook along the east side of the Going To The Sun Road in Glacier National Park. The hike to St. Mary Falls / Virginia Falls is a waterfall lover's dream come true! The pullout to the trail head for St. Mary Falls / Virginia Falls is located just 0.3 miles west of Sunrift Gorge along the Going To The Sun Road in Glacier National Park. This pleasant 1.7 mile hike (one way) is a dream for those who love beautiful waterfalls. For detailed information on the trail to St. Mary Falls and Virginia Falls click here. This is a short 75 foot walk to an incredible view of a water-carved gorge. Sunrift Gorge was formed when a small stream cut through a natural break in the rock. With turquoise colored water rushing through it, this makes for a very unique natural feature. 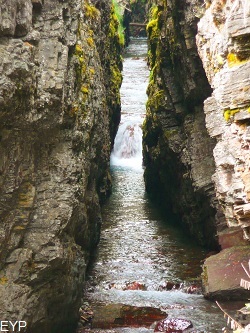 Sunrift Gorge was cut by Baring creek which originates near Sexton Glacier. 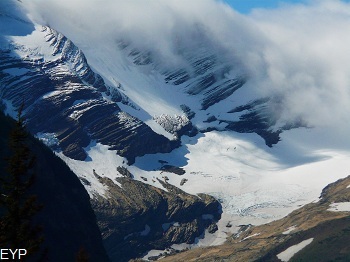 This Glacier rests on the east face of Going-to-the-Sun Mountain, and can be seen from the Siyeh Pass Trail. This trail starts at the Siyeh Bend, goes over the Siyeh Pass, and ends up following Baring Creek down to the Going To The Sun Road at the Sunrift Gorge Pullout. Baring Creek exhibits several gorges along this hike, but the most dramatic is Sunrift Gorge. 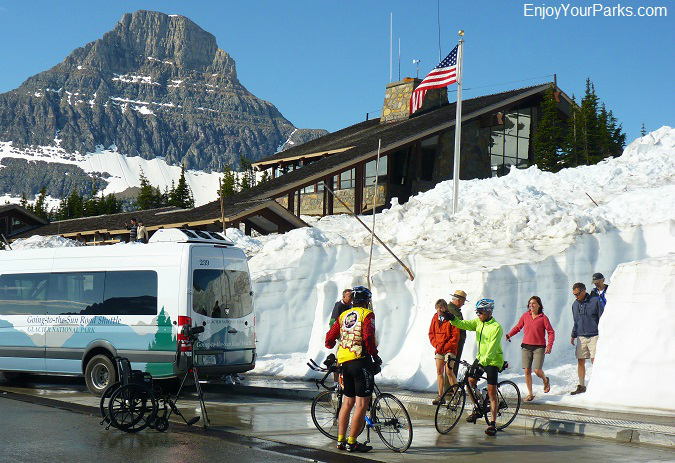 Fortunately it is located just off the Going To The Sun Road so everyone can enjoy it. It only takes a few minutes to enjoy this pullout, and it's definitely worth taking the time to see it! Visitors enjoying their time at Baring Falls, located just off the Going To The Sun Road in Glacier National Park at the Sunrift Gorge Pullout. Baring Falls is located just off the Going To The Sun Road at the Sunrift Gorge Turnout. The trail takes you several hundred yards down to Baring Falls. This is a very quick and pleasant walk, and well worth the effort if you're in the mood for a quick leg-stretcher with a beautiful waterfall waiting for you at the end. Sun Point along the Going To The Sun Road in Glacier Park provides incredible scenery! Sun Point is a "must see" along the Going To The Sun Road in Glacier National Park. The view of the mountains and St. Mary Lake is absolutely spectacular. This is also an historic location because it is where the Going To The Sun Chalet once stood. The parking area is very large, and the short walk to the actual Sun Point is easy and very beautiful. There is a wonderful picnic area and a self guided trail (1 mile) that works its way along the breathtaking shores of St. Mary Lake. The Sun Point Nature Trail (1.2 miles one way) offers fantastic views of St. Mary Lake and cascading Baring Falls, as well as towering mountains. Sun Point is 10.1 miles east of St. Mary and is only about a half of a mile west of Wild Goose Island. The St. Mary Lake Overlook is located just west of the Wild Goose Island Pullout along the Going To The Sun Road in Glacier National Park. Little Chief Mountain towers over you as you gaze upon this incredibly beautiful lake. You might even get to watch one of the wooden tour boats go by. 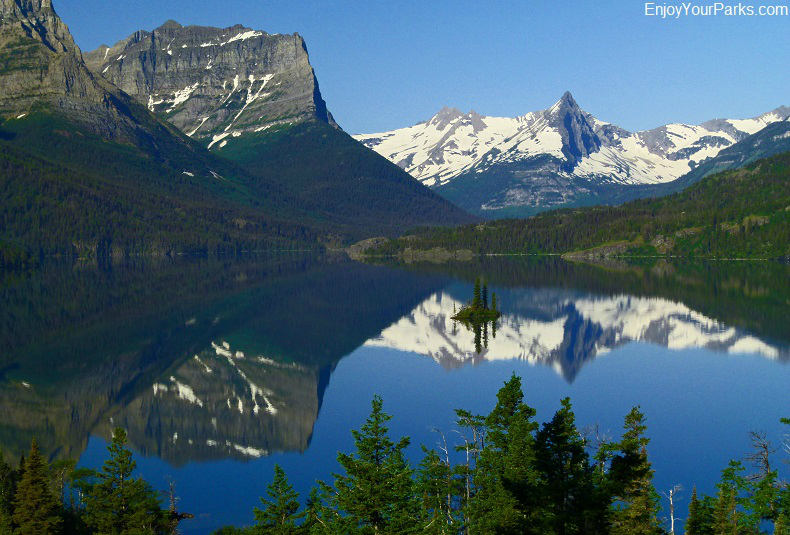 This view of Wild Goose Island along the Going To The Sun Road is one of the most photographed places in Glacier Park. Wild Goose Island is one of the most photographed places in the world! 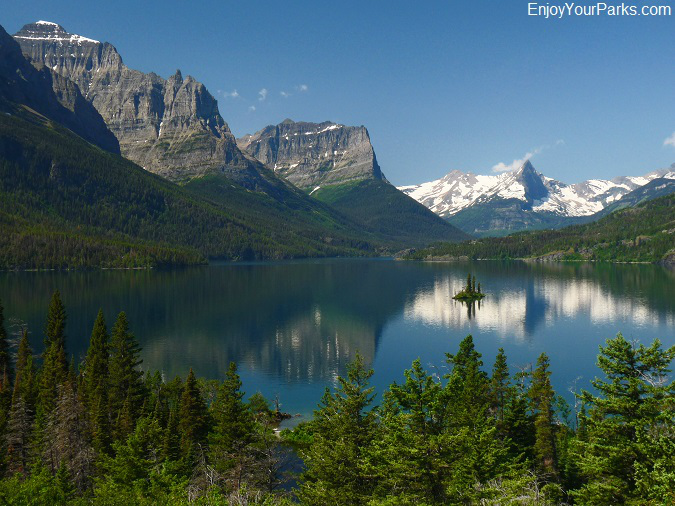 This classic Glacier Park landscape is found in tens of thousands of travel books and art galleries with good reason: it's unbelievably breathtaking and awe-inspiring. 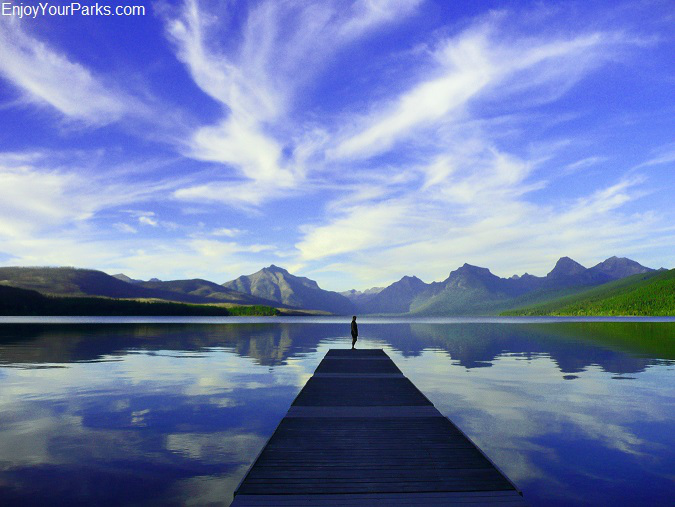 This view is nothing short of magnificent, and is definitely one of the most famous scenes in Glacier Park. 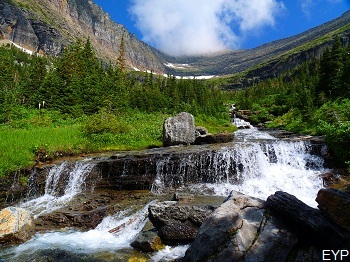 It is the classic image of Glacier National Park, and is located just west of Rising Sun Motor Inn on the east side of the Going-to-the-Sun Road. By the way, geologists still haven't figured out why this island exists because thousands of years ago, a huge valley glacier completely carved out this entire valley where St. Mary Lake is presently at, and the lake floor is hundreds of feet below the entire island. How this narrow piece of earth survived is a complete mystery. By the way, the best time of day to see this iconic image of Glacier National Park is in the morning, anytime between sunrise to about 11 o'clock. Those hours are when the morning sun is lighting up the lake and the mountains. In the afternoon, it's still extremely beautiful, however the sun is in your face and somewhat washes out the view. But no matter what time of day, it's one of the most scenic places on earth and you can't go wrong! 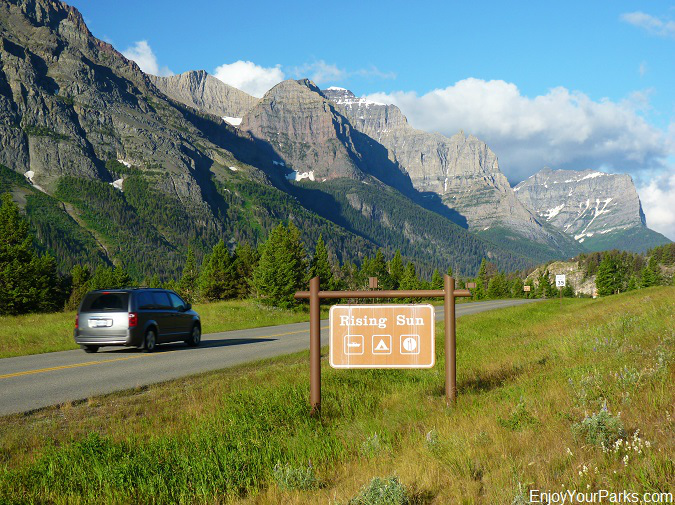 Rising Sun is where you begin to meet the great mountains of Glacier National Park when coming in from the East Entrance at St. Mary along the Going To The Sun Road. 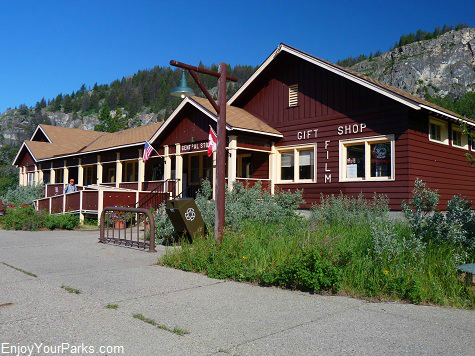 Rising Sun is about 6 miles west of the St. Mary Entrance, and provides visitors with a camp store, cabins, motor inn, showers, restaurant and campground. 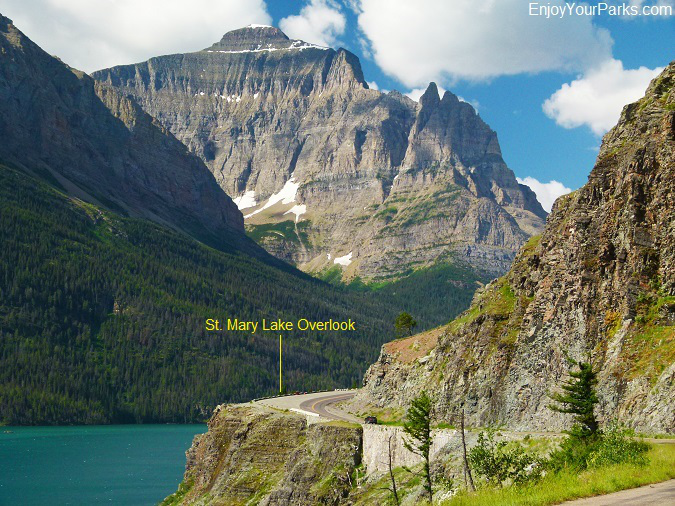 Across the Going To The Sun Road is a boat dock on St. Mary Lake where you can take a wooden boat scenic tour. Rising Sun marks the spot where you begin entering the massive mountains that surround the Going To The Sun Road as you work your way up to Logan Pass from the east side. 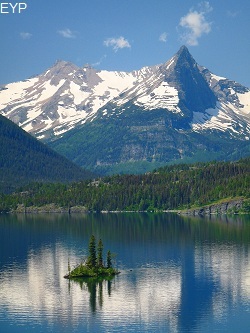 Otokomi Lake is a very popular Glacier Park hike that originates at Rising Sun. For more detailed information on the hike to Otokomi Lake, click here. St. Mary Visitor Center along the Going To The Sun Road in Glacier National Park. 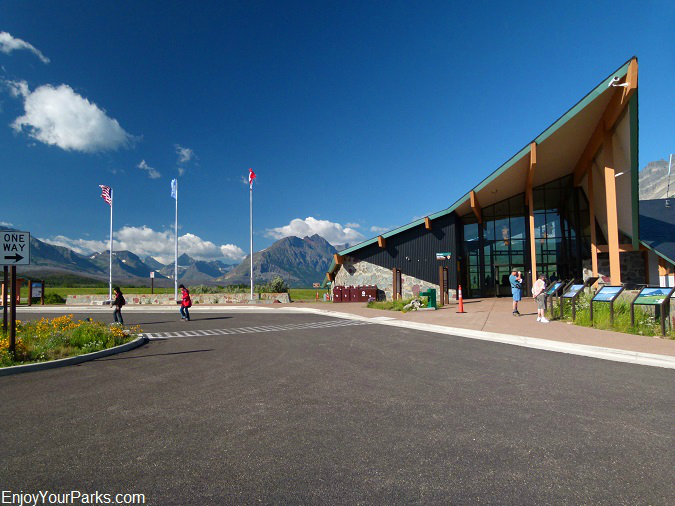 The St. Mary Visitor Center / East Entrance marks the place where the Going To The Sun Road in Glacier National Park begins when entering the park from the east, and marks the end for visitors coming from the west. 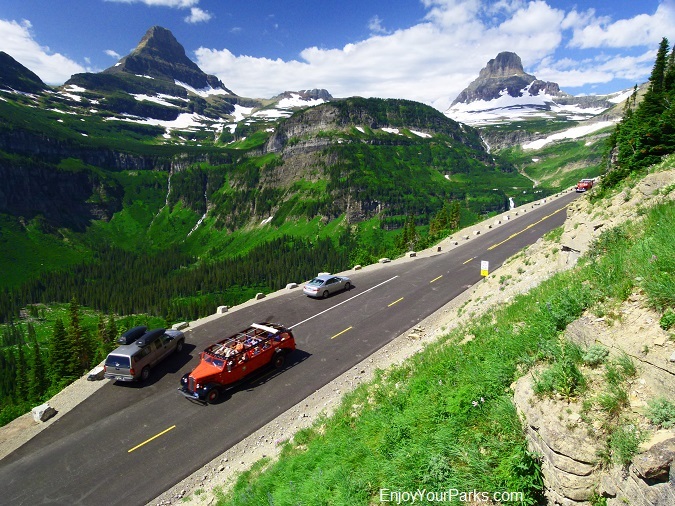 Once you experience the magic and magnificence of the Going To The Sun Road, you will understand why this is one of the most beloved scenic roads in the entire world. DRIVE THE SUN ROAD BOTH WAYS! Please consider our strong recommendation to drive the Going To The Sun Road BOTH WAYS- from east to west and west to east. The views are completely different each way, and are very much worth your time. If you only go one way, you're missing out on half of the experience!